Self-drive Holidays in Germany West for the Independent Motorist. Western Germany is the most accessible part of Germany, and the most visited by British tourists. As well as the cities of the north, including Cologne (Koln) and Bonn, the great attraction is the valley of the river Rhine, flowing through spectacular gorges past magical castles clinging to rocky outcrops. In the south is Frankfurt, vying with London to be the financial capital of Europe. In the north of the North Rhine and Westphalia provinces are the great industrial cities of Dusseldorf - with a lively Old Town -, Dortmund, Bochum and Essen. With the scaling-down of much heavy industry, these cities with their historic centres and sophisticated cultural life, are all worth a visit. Aachen has some magnificent historical buildings, especially its superb Dom. 30 kms south is the wonderfully preserved town of Monschau, with the river Rur rushing past its ancient houses. Cologne is a beautiful and impressive city, with its great cathedral, Roman remains, medieval buildings and world class museums. Bonn, Beethoven's birthplace, is a pleasant airy town with a good range of excellent ethnic restaurants. South of Bonn are the mountains of the Siebengebirge, land of many a Germanic legend, and a popular tourist destination with good winter sports' resorts. The Teutoburg Forest in the north is a popular walking area. 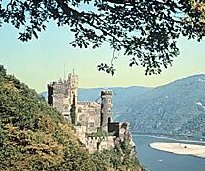 The province of Rhineland-Palatinate contains the most spectacular stretches of the river Rhine. This is the land of the German legend of the Nibelungenlied; the rocks of the Lorelei, whose song enticed sailors to their watery graves; of delightful whitewashed towns clinging to spectacular cliffs and vine-covered hillsides; of ruined fairy-tale castles perched on rocky outcrops. Add to this the historic city of Mainz, the cathedral cities of Worms and Speyer, as well as the fine classical remains at Trier, and it's easy to understand the popularity of this beautiful region. Situated right in the heart of Germany, the province of Hesse was the setting for the tales of the Brothers Grimm. The dark forests, ancient castles and half-timbered towns are typical of the tourists vision of Germany. In complete contrast is the great modern city of Frankfurt Am Main, one of the main financial centres of modern Europe, with skyscrapers jostling for position next to the historic Old Town with its very lively nightlife catering for all possible tastes. In the attractive suburb of Sachsenhausen, visit the fine museums along the Museumsufer then try the many excellent restaurants where the speciality is the local apple wine. The forests and highlands of Hesse abound with walking trails through delightful scenery. The most famous area is the Rheingau in the south-west where some of Germany's best wines are produced. There's a driving route and a walking route to tempt you to taste and maybe buy. In the summer the area is host to a well-known classical music festival scattered throughout the many pretty towns. In the centre of Hesse is the Taunus range of hills, with superb hiking trails and the attractive spa town of Bad Homburg. Don't leave without visiting Marburg, one of the most beautiful medieval towns in all Germany.